here’s a shameless plug for medium, twitter’s new thing. it’s basically blogs that are public, like twitter. the nice thing about it is that you can follow medium on twitter and they will post when a decent new one is published. and at the top of the posts? it’ll tell you how long it will take you to read the blog. i’m calling it a twog – twitter blog. there are editor’s picks, featured collections and posts, about things you didn’t even know you needed to know about! take the “best of” from blogs all over the webiverse and put them in one spot: medium. love it. 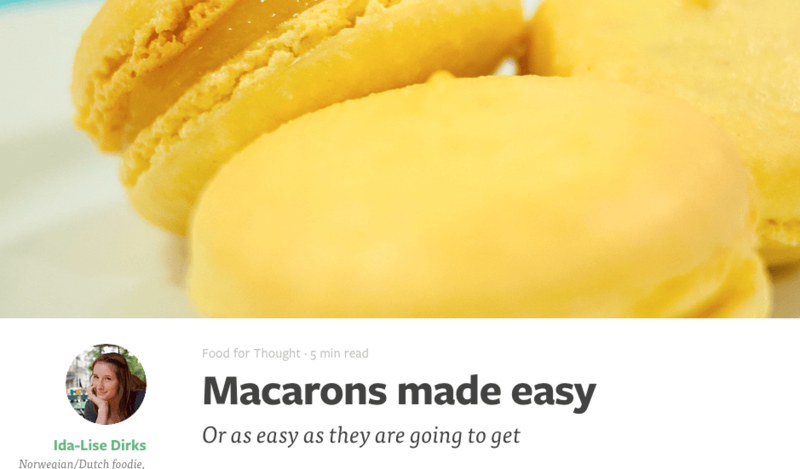 and when there’s a blatant spelling error on a post that’s been sent to twitter, the twitter masses will always be there to correct; case in point: a post on macarons (…or macaroons as it had been originally published). yeah i was an annoy twitter corrector. oh well! so there is my recommendation and shameless plug of the day. it’s like if all your favorite bloggers posted to the same blog. if you want a really easy way to keep up to date on them, follow @medium and they’ll tweet when a picked post is published.